On the twentieth anniversary of the release of the 1990 film Tremors, we here at Chronological Snobbery pause to ask the following five questions about the film's place in history. 1. 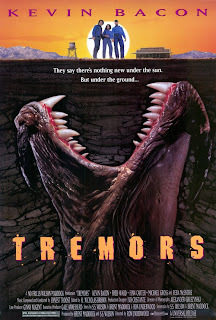 Has it really been two decades since Tremors was released on January 19, 1990? 2. What would have become of "Family Ties" actor Michael Gross had he not been cast in this film, its several sequels, and a resulting spin-of television series? 3. As this was the first film in which country singer Reba McEntire appeared (and really, her first meaningful acting role), do we have this film to blame for starting her down the path to "Reba," her television series which aired from 2001 to 2007? 4. When Kevin Bacon (now a Golden Globe winner) pauses to reflect upon his career, what enters his mind when his wandering thoughts turn to this film? 5. What does it suggest that Gale Anne Hurd produced blockbusters like The Abyss in 1988 and Terminator 2: Judgment Day in 1991, but Tremors in 1990? This movie is memorable in my life because it was the movie I saw on my first "date".